Last week I posted info about Ben Gibbard’s board, but wanted to focus on the bass player today. More and more effects are seen with bass players these days, and want to be sure to focus these players as well! 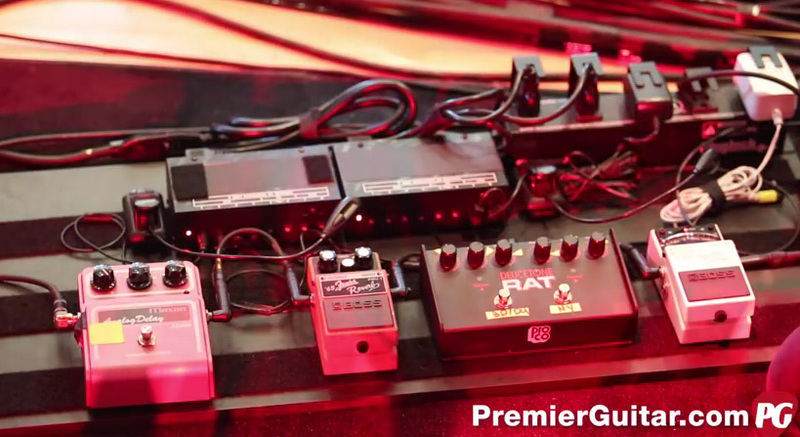 So today, we’re going to talk about the pedalboard of Nick Harmer of Death Cab for Cutie. This is from the same rig rundown video that Premier Guitar put together for Death Cab for Cutie. Be sure to subscribe to Premier Guitar! Nick mentioned that he recently removed a few pedals, I thought it would be cool to mention those as well. Be sure to watch the video on the reasoning on why he removed them.Good food for thought. Let me know what you think about Death Cab for Cutie.. and/or Nick Harmer, and if you see anything incorrect with the information above by commenting below!